You don’t have to be in Olympic-athlete shape to play golf, but the essence of the game revolves around a smooth, even swing: something harder to achieve around a protruding belly. Happily, golf is good exercise in itself, and long walks regularly are also a recommended low-joint-stress way to stay fit. Make sure you’re eating right for your metabolism, and get in a round at least twice a week; that’s our prescription. Ever Thought of Yoga or Pilates? See Point 6 below: you need to get rotation through the entire torso from the hips in your full shots. Stretching before a round is essential, but you may find that another exercise programme, such as Pilates or yoga, which promote limberness through stretching, brings added benefits out on the links. When first buying or later adding to your clubs, get advice from a pro on the optimal face-angle for each type, depending on your proficiency. Most of all, practise using every club in exactly the same stance when you’re playing full shots; i.e., not pitches or putts. It’s something novices find counter-intuitive, but it is critical to developing a consistent swing. 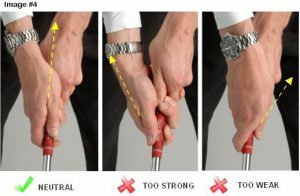 The thumb and index fingers of both hands should form two Vs, and you need a solid, comfortable grip before you attempt anything else. Tips on grip, swing and other golf essentials are often included on many sports betting sites. Addressing the ball square-on is essential to accuracy and power in your swing. Learn this properly before working on striking the ball; while practising, use alignment sticks or a towel to line up your feet parallel to the correct line of swing. A rookie mistake is to try to swing from the shoulders. Your hips and torso are essential, so start rotating your hips, then your torso, before taking your arms and shoulders back. You need to use your whole body to put maximum power into the shot. At the full extent of your backswing, your rear leg should be straight and almost locked: this allows you to trigger your downswing smoothly, in the correct line, with a little hip-bump. Getting a sense of the clubhead and how it moves is something that takes time and practice. You want to unwind club, arms, shoulders and hips in one smooth rotation on your downswing, with the clubhead moving in an arc. Getting it on the green is only half the battle; accurate putting is what wins golf matches. The right putter to suit your level of expertise helps, but the only way to get better is to practise putting as often as possible. …although that lets you improve your golf score, not necessarily your golf game! But it’s only a friendly, right?